Surprisingly nimble for a pile of ... rock? Bonus updates will continue tomorrow. A previous comment mentioned Ariara might deal with " The Worf Effect. " Seems he/she might be right. The abilities Burk has already displayed seem rather useless against these new villains (let's call them Midas and Rockpile). I wonder how he'll beat them? Ariana just got hit with dubstep! I hope she doesn't get Worfed here (although to be fair Worf didn't get Worfed as bad or as often as people seem to think.) However she does have her defenses up and there isn't really a reason that this guy should be able to get through those easily and Ariara can probably hit him with harder things that just swords. as for mutto-"Rockpile " seems to have incredible strength and well...tough as a rock? There wasn't any light shed on what he's actually made out of. Pablo might also have an ace up his sleeve. Ariara certainly got her wish from panel one. She seems to be impressed. As for Burk, I think that he should be happy too, now - so many evil bosses in one place to beat. 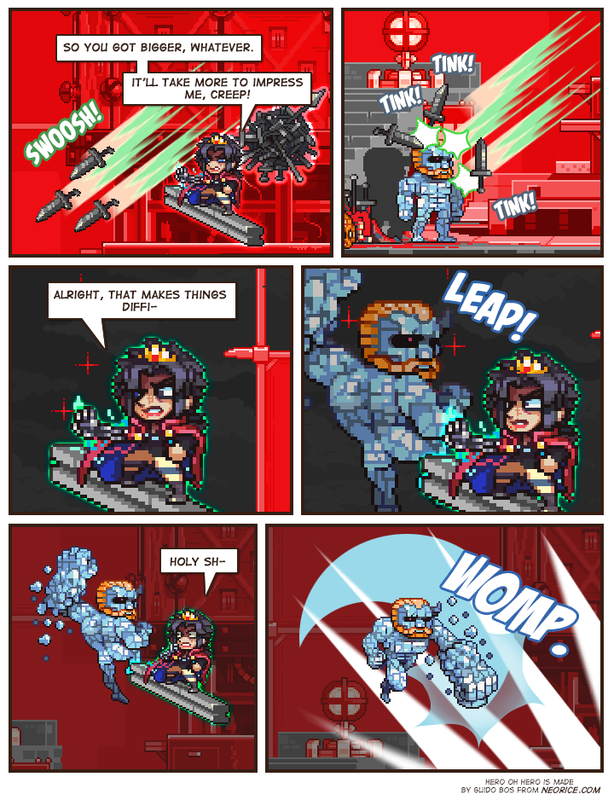 The 4th panel, with the red sparkly-looking things, reminded me of Major Armstrong from FMA. Mutton-chops sure looks like a manly man.